Retail businesses must work hard to stay competitive in the market, so they can attract new customers and increase profits. To ensure success for your business, work with the retail accounting professionals at Steven L. Nartker, CPA APC. We pride ourselves on being an accessible and highly reliable San Diego, CA CPA firm for retail business. We’ll help you get past financial obstacles to maintain a healthy, thriving company. We can show you how to maximize cash flow, streamline accounting procedures, and utilize appropriate tax planning strategies to retain more of your profits. 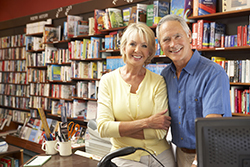 Tax planning is a key component in profitability for retail businesses of all sizes. At Steven L. Nartker, CPA APC, we’ll develop strategies around your particular business to reduce liability, while staying in compliance with current tax regulations. Because we’ve worked with many retail businesses, we can identify industry-specific tax credits you’re entitled to and can determine when routine remodeling costs should be deducted or capitalized to bring the most tax savings. Our retail accounting services are affordable for businesses of any size and we extend a free initial consultation. Contact us today at 858-675-1533 to learn more about our retail accounting and tax services or request a consultation online now.